The Atlantic Cup is committed to being the most environmentally responsible sailing race in the United States. Since 2012, with the help of 11th Hour Racing, we have been a carbon neutral event and have offset 95+ tons of CO2. In 2016, the Atlantic Cup was ISO 20121 compliant, making it the first sports event in the U.S. to achieve that status. In addition, the Atlantic Cup is the only regatta globally to be certified Platinum in 2016 by Sailors for the Sea. How Are We Carbon Neutral? How do the teams minimize impact? The 2016 Atlantic Cup presented by 11th Hour Racing is the first sports event in the United States to be ISO 20121 compliant. ISO 20121 is a management system standard that was designed to assist event-oriented organizations improve the sustainability of their activities and productions. The international version of the standard was developed for the London 2012 Olympics and it describes the layout of a management system that can help any event related organization to: reduce its environmental footprint, become more socially responsible, while maintaining the viability of the event. The Atlantic Cup downloaded and followed the ISO 20121 protocol and complied with the rigorous standards meeting a self-certification. For the first time in its five-year history, the race had a robust waste management plan which included 538 lbs of compost, 394 lbs of recycling and 139 lbs of trash sent to a landfill giving the overall race an 88% landfill diversion rate. 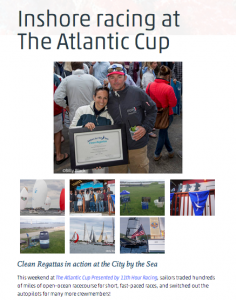 The Atlantic Cup has been single-use plastic water bottle free since its inception in 2011. In 2016, the race prevented 8,520 single-use plastic water bottles from being used. This year the official carbon offset supplier for the 2016 race, We Are Neutral, offset 29 tons of CO2. Since 2012, the Atlantic Cup has offset 95 tons of CO2 total. 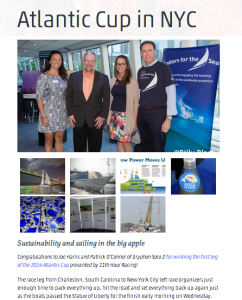 The Atlantic Cup is the only sailing race in the United States to have offset its carbon footprint since 2012. We Are Neutral will use The Atlantic Cup’s carbon offsets to plant indigenous trees on local conservation land, and by performing free of charge energy retrofits for low income families. In 2104, The Atlantic Cup presented by 11th Hour Racing aimed for carbon neutral status and through the help of Nexus our Carbon Offset Sponsor, we did it for the 3rd year in a row! 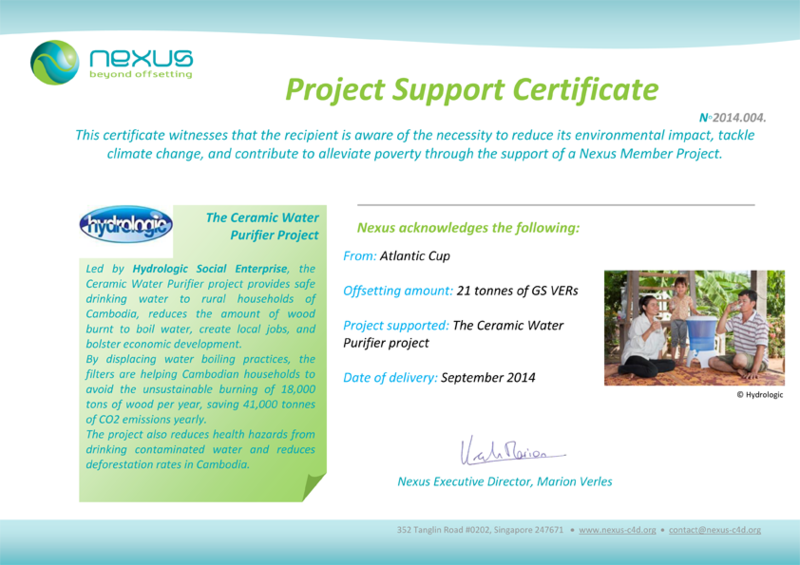 Nexus offset the race’s footprint with carbon credits supporting Hydrologic, The Ceramic Water Purifier Project. Hydrologic locally manufactures ceramic water purifiers (CWP) that provide clean drinking water to rural households resulting in reduced wood fuel consumption while supporting local economic development. 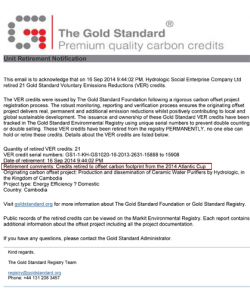 21 Gold Standard Voluntary Emission Reduction credits were retired on the Markit Exchange. In addition, Sailors for the Sea, our Clean Regattas partner, tracked our progress throughout the race. Click on any of the images below to learn more about this year’s Atlantic Cup presented by 11th Hour Racing! 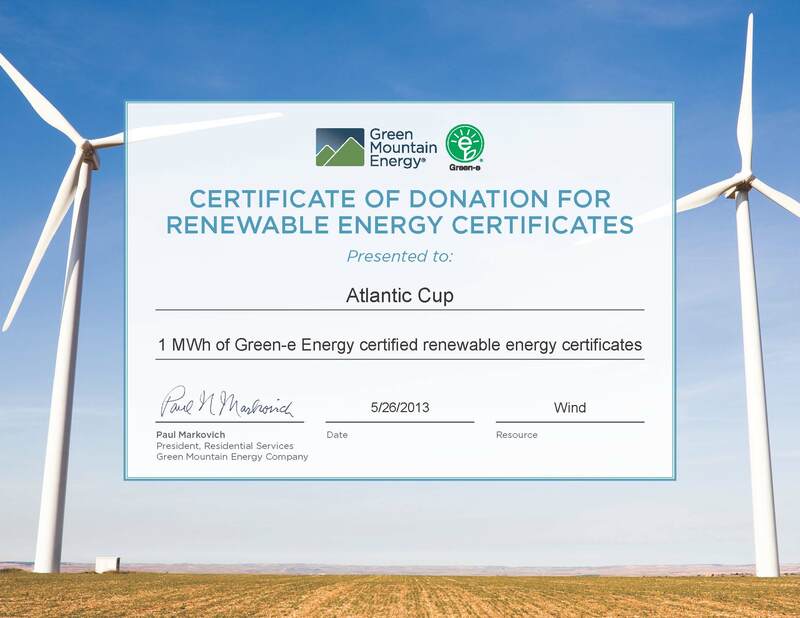 Based on calculations the Atlantic Cup in 2013 emitted 30 metric tons of CO2 and 1 mega-watt hour of electricity. 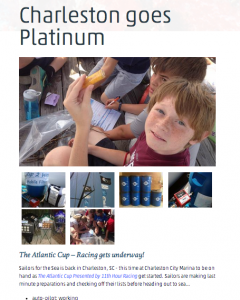 In 2013 Sailors for the Sea announced a new Platinum Level Certification, which the Atlantic Cup was the first event to meet all of its requirements. The Atlantic Cup takes an overarching approach so that all event operations are looked at through the lens of how can we minimize impact. Some of the areas we track during the race include: Electricity, hours of monitor use, hotel night stays, attendee travel, printing of signage, food production, food waste and other waste, shipping, creation of event materials (programs, tickets etc. ), office supplies, and water bottles. Now add in the sailboats and teams’ support and competitor fuel consumption, on board energy production, competitor trash, water (not the water they sail on), cleaning products, and waste. Below are some of the steps that Race Management takes to mitigate their fossil usage. We Are Neutral is the official Carbon Offset Supplier for 2016. Founded in 2008, We Are Neutral created the first carbon neutral sports program at the University of Florida. In addition, they provide the carbon offsets for the annual music festival, Bonnaroo. We Are Neutral’s carbon offsets are created by planting indigenous trees on local conservation land, partnering with local landfills to capture methane emissions and by performing free of charge energy retrofits for low income families. 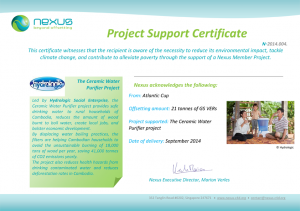 Nexus Carbon for Development offset the 2014 Atlantic Cup carbon footprint. 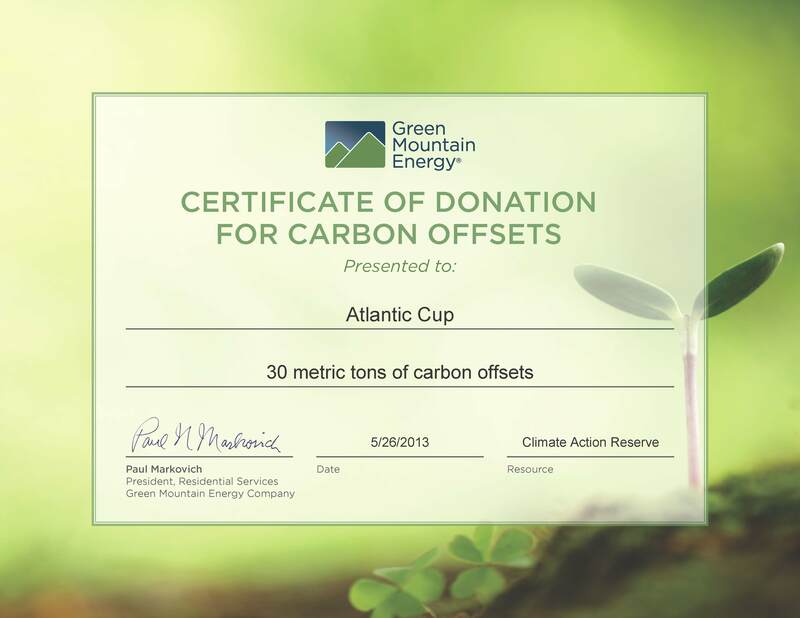 Green Mountain Energy Company offset the Atlantic Cup’s carbon footprint in 2012 and 2013. Recycling and compost stations are set up in all three marinas and at all hospitality parties. Race Management tracks the distance waste travels to fully understand the complete effect of waste generation. All hospitality parties use glassware or biodegradable plastic to minimize waste entering landfills. We provide onsite water filling stations in each city so that teams and guests can fill their canteens. No plastic water bottles are sold or available to guests or teams. 100% post-consumer recycled paper is used in the Manuka Sports Event Management offices and will also be used for all event packets, tickets and handouts. Not everyone realizes that to race offshore, teams need electronics and those electronics don’t mysteriously power themselves. The Class 40, the boat used in the Atlantic Cup, is designed to race offshore and has a good deal of electronic systems on board: standard navigational displays, routing computers, water ballast and an autopilot to name a few. Additionally, race management’s operations require electricity and fossil fuel to bring the Atlantic Cup to you. Below in greater detail are more specific examples of what the Teams do to help the Atlantic Cup achieve carbon neutrality. Teams use an alternative fuel source to charge batteries which power all the on-board electronics while offshore. This may include, fuel cells, solar panels and/or hydrogenerator. Check out the video below of Icarus Racing’s Tim Fetsch explaining how a hydrogenerator works. While some fuel is needed to run the engine while getting to and from the docks, biodiesel is provided for the fleet to use as a blend in their engines. Newport Biodiesel supplies all of the competitor boats with biodiesel to create a B20 blend (that’s 80% unleaded and 20% biodiesel). Realistically teams could put 100% biodiesel in your marine engine and some of the teams do use more, but Race Management sets the bar at 80/20. The Atlantic Cup is a plastic water bottle free event and as such all teams are required to use their water tanks and reusable canteens for water. All teams will be required to recycle any waste from the offshore and inshore portion of the race. Race Management supplies each team with compostable trash bags. Most of the waste that the teams create that isn’t recyclable while offshore will break down over time in a landfill. So it’s important to give the teams a trash bag that will breakdown in the landfill. All teams use environmentally friendly cleaning products to wash down and clean their boat. While we’ve achieved many great milestones to bring sustainability and sailing together, our planet, sadly, is still in major need of our help. We know that for real change to occur it needs to happen everywhere. Unfortunately, not one person or one government or one sailing race can make our warming planet, acidifying oceans, and rising seas reverse course, it will take all of us to do our part and make small changes every day that will over time make a difference. So with that in mind, we are turning our focus to you, our fans and what small, simple things you can do to make a difference! 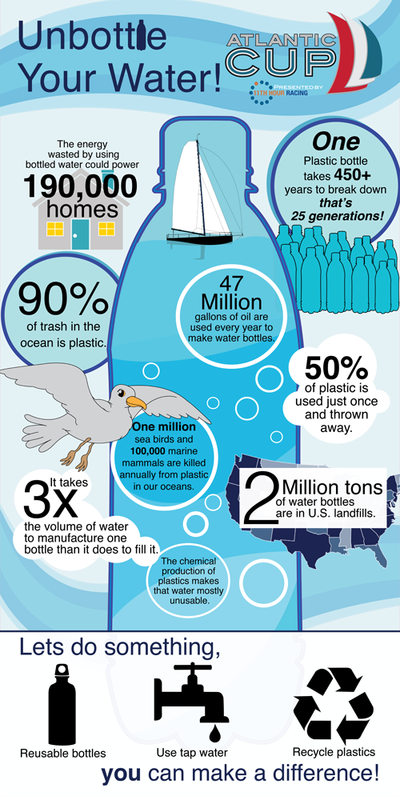 In the coming months we’ll be sharing all kinds of tips and tricks on ways you can make small changes in your every day life (check out our water bottle infographic below!). 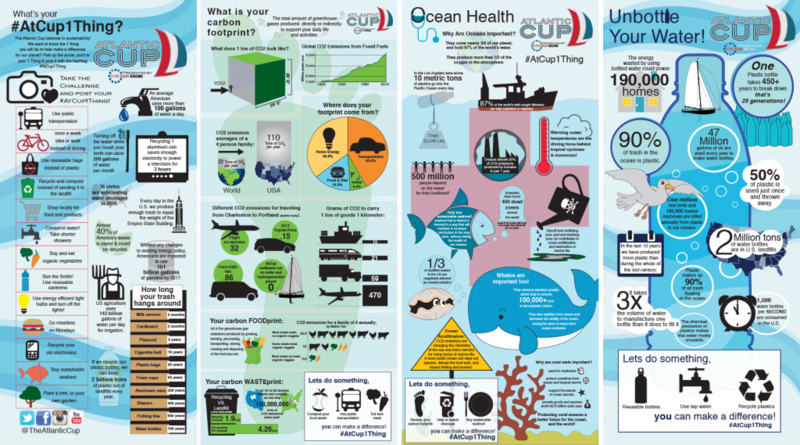 Follow us on twitter @TheAtlanticCup and #AtCup1Thing & share with us the small changes you make! © 2019 Manuka Sports Event Management, LLC.